With so few options now available to players from the United States as far as where they can play poker online, millions of players have been longing for a real money poker room to be able to play at without having to worry about it being shut down, their money being seized, waiting weeks or longer for cashouts, and other indignities. Most players are simply laying low waiting for regulated poker to begin, where you can play at a poker site for real money without any of these worries. So many players have grown sick of all the shenanigans and just want to play somewhere where it’s totally legal to do so and you don’t have to worry about the government attacking your poker site. American players have always been forced to play online poker in the black market, from day 1, and the situation has grown worse and worse over the years. First, the UIGEA was passed, targeting offshore online poker rooms, resulting in most of them no longer offering online poker to Americans. Then, the government’s mighty hand came down on the world’s biggest poker rooms, putting the run to PokerStars, and putting Ultimate Bet and Absolute Poker completely out of business, where players from all countries lost all their money, and crushing giant Full Tilt Poker, leaving hundreds of millions worth of player money unpaid, with no one knowing if they will ever get their money. 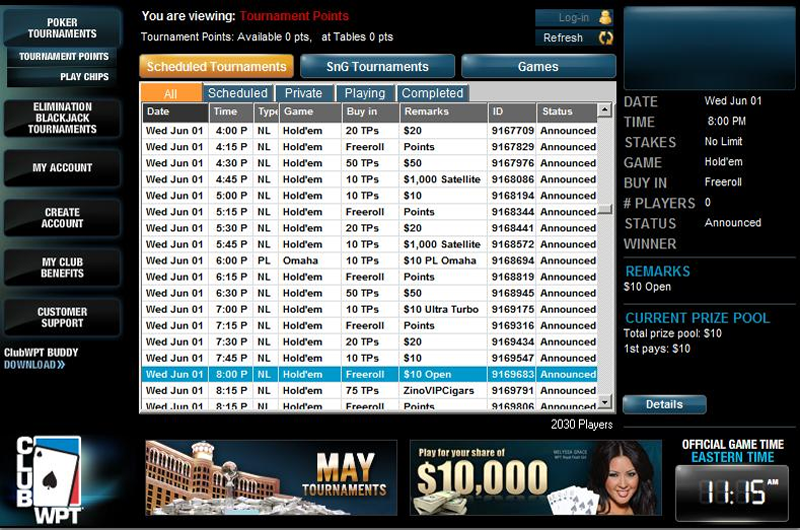 Needless to say, this has decimated the American online poker market, and has left players with a real reluctance to re-enter the online poker scene. Players are left pining away in the hope of one day seeing a completely legal online poker site that they can play at without any worry of interference. That day has finally come. Club WPT now offers a 100% legal real money online poker site which is available for players from most states in the USA to play at, in addition to those from several other countries, which offers an exciting and unique way for people to get back in the game. Cliub WPT offers over 5000 real money poker tournaments a month, with a total prize pool of over $100,000. The cool thing about what they have to offer is that members can play in as many of these tournaments as they wish, all you can eat so to speak, for only a small monthly fee of $19.95 or less. You can spend this much or more for a single tournament elsewhere, and even the smallest buy in tournaments out there, of $1, will cost you over $30 a month if you just play one every day, and you won’t be playing for anywhere near the kind of prize money that Club WPT offers you. So in terms of value, Club WPT truly stands out from anything else out there as far as real money tournament poker goes. The real beauty of Club WPT though is the way that it is set up. Most states in the U.S. allow membership sites to run sweepstakes, meaning that members receive content like books or magazines, from places like Reader’s Digest and Publishers Clearing House, and in order to attract people, they run sweepstakes where money and other prizes are given away as an enticement. Well that’s pretty much how Club WPT works, and they do have a wide assortment of content that is included in their membership offering, and also run a sweepstakes or sorts, which are the poker tournaments. Therefore, as long as sweepstakes are legal, Club WPT is legal. This isn’t just speculation, it’s a fact. So this is how people from most states can play real money tournaments at Club WPT, in addition to players from other countries as well. Players from the following states are eligible to become members of Club WPT and take full advantage of all of the benefits of being a Club WPT member, including free access to as many of their over 5000 tournaments per month. The states that Club WPT accepts players from are Alaska, Arizona, California, Colorado, Connecticut, D.C., Delaware, Florida, Hawaii, Illinois, Iowa, Kansas, Kentucky, Louisiana, Maine, Massachusetts, Nebraska, Nevada, New Hampshire, New Jersey, New York, North Carolina, North Dakota, Ohio, Oregon, Pennsylvania, Rhode Island, Tennessee, Texas, Utah, Vermont, Virginia, West Virginia, Wisconsin, and Wyoming. While players from these countries have no problem playing at real money poker sites, unlike players from the United States, Club WPT poker is such a great value for the money that a lot of players from these other countries have joined up as well. Since it’s free to play in all of the tournaments at Club WPT, you will be shooting for your share of the massive amount of prize money that they have for you without risking or standing to lose a cent. If you’ve ever played real money poker, you know how frustrating it can be at times, especially when you lose your money to sheer luck arising from the inferior play of your opponents. These so called bad beats can drive players crazy. Why do players get so upset here? Because they just lost money in a situation where they didn’t feel they deserved to. What’s the ultimate remedy for this? Be in a position where you never lose money, and therefore never have anything to get upset about in the first place. When this happens, you just sign up for the next free tournament. Another big issue with real money poker, and especially with real money tournaments, is you can go through some real cold streaks, some real long term runs of bad luck, which can send your bankroll into a real tailspin. Bad beats are in fact more of an annoyance, in spite of the intense rage they can often cause. Long bad luck streaks are the real deal, where players often become despondent, and not without good reason in a lot of cases. By far the worst situation where real money poker is concerned is simply not being good enough to beat the games, and watching your losses continue to pile up. The more you play, the more you lose, and when you look at the long term here, it’s really all straight down, with some brief interludes of fortunate luck mixed in. It’s estimated that about 9 players out of 10 are losing players long term, and that’s a lot of players. This is a necessary fact of online poker in fact. Due to the element of the rake and fees, few players are good enough to not only beat their opponents, but to beat them enough to show a profit after all the rake and fees that they end up paying. So only about one player in 10 is good enough, although that’s certainly better than casino gambling for instance, where 10 out of 10 have a negative expectation. Even if you are a winning player, your winnings aren’t straight out, and they often involve fairly large losing streaks, which is simply a matter of the distribution of probability. However, few players are even in this category. Still though, millions of players play real money poker every day, simply because it is so much fun. Playing simply for fun, meaning with play money, just isn’t anywhere near as much fun though, and while a lot of people play for fun, once you have tasted the additional thrills of playing for real money, you can’t really ever enjoy the play stuff anymore. However, playing to win real money usually involves the risk of losing real money. Wouldn’t it be a lot better if you could play for real money without ever losing real money? 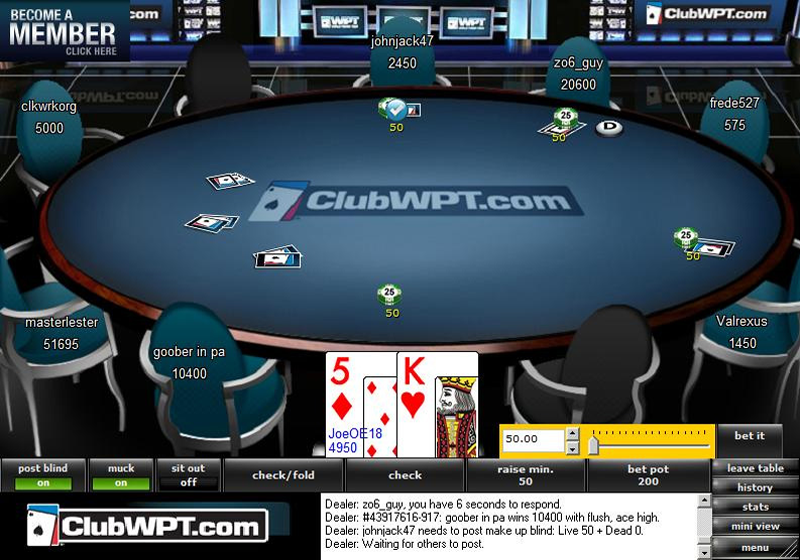 Say hello to Club WPT. Since WPT stands for the World Poker Tour, their headline tournaments offer full prize packages to World Poker Tour events, including your tournament fee for your seat at the tournament, hotel, and travel expenses. Imagine yourself being flown off to an exotic destination, put up in a 4 star hotel for a week, and treated like a star as you take a shot at millions of dollars in prize money and all of the glory that comes with it. A top finish at a WPT event can in one fell swoop set you up as a top pro, where you can become a regular on the tour with all the great things that this brings. Club WPT also offers loads of cash every month, headlined by their $10,000 guaranteed tournament, with a first place prize of $1000, and the top 250 places paid. There’s also plenty of other money tournaments, including a weekly $2,000 guaranteed deep stack tournament. They also offer members chances to win seats at the prestigious WPT Boot Camp, valued at almost $2000, where you get face to face lessons from some of the world’s top poker pros. Club WPT also offers a leaderboard challenge, where you compete against other members, and based upon how well you do overall, you can win additional cash prizes as well as bragging rights. How well do you really stack up overall in terms of your playing ability? Club WPT’s leaderboard promotion will let you find out. Club WPT members also receive a free online subscription to WPT Poker magazine, full of poker stories, interviews, strategy tips, and more. You also get access to back issues as well, and there’s quite a bit of good reading here. Members also receive the benefits of the Club WPT Savers Guide, which offers big savings on shopping, dining, travel, movies, attractions, services, and more. With what you can save here, you can pay for your Club WPT membership several times over. You also get a nice selection of free downloads such as ring tones, wallpaper, and avatars. You also get access to exclusive features and articles, poker tips and strategies, and online video access to full seasons of the WPT on TV. While access to the tournaments is definitely the main course here, all this extra stuff does add up to some real niceties and you can even think of them as what you are paying your membership fee for, with the tournaments as a bonus. Club WPT is so confident that you are going to love being a VIP member with them that they are offering you a two week free trial to their site. This is the full access membership with unlimited access to their tournaments and everything else they have to offer. You do need to provide your billing information, so they can bill you should you decide to stay on, which you will want to, but you still have the option of cancelling at any time during the two week free trial and never be billed for anything. The first thing that you do though is sign up for a basic account, where you just provide them your contact information, and gain access to some of the features that they offer. Then you upgrade to the VIP membership and try that out to get access to the tournaments and premium features of the site. If for some reason you aren’t able to start your paid membership right away, there’s no need to worry, as you can remain a basic member for as long as you need to, and whenever you are ready for the full deal, it’s very easy to upgrade. So there’s no reason why everyone shouldn’t at least start out with the basic membership, although with all of those great tournaments waiting for you, you are going to want to upgrade your membership as soon as you can. Club WPT also offers additional discounts for those who are willing to pay by the year or the quarter. Instead of the monthly rate of $19.95, you can pay $53.58 quarterly, which works out to $17.86 a month, or save even more by paying by the year, which will cost you $179.40, which works out to only $14.95 per month. Regardless of your circumstances, where you live, how much you want to spend if anything, or how convinced you may be right now that this is a great deal, there’s absolutely no reason why you should wait to register with Club WPT right now. 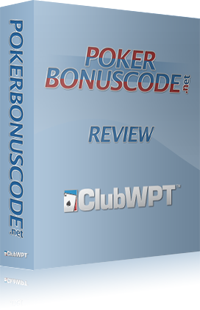 We even have a Club WPT bonus code that you can enter in, “CLUBBONUS”, to get some additional surprises when you become a full member. So just click on our direct link to them and start enjoying everything they have to offer right now!